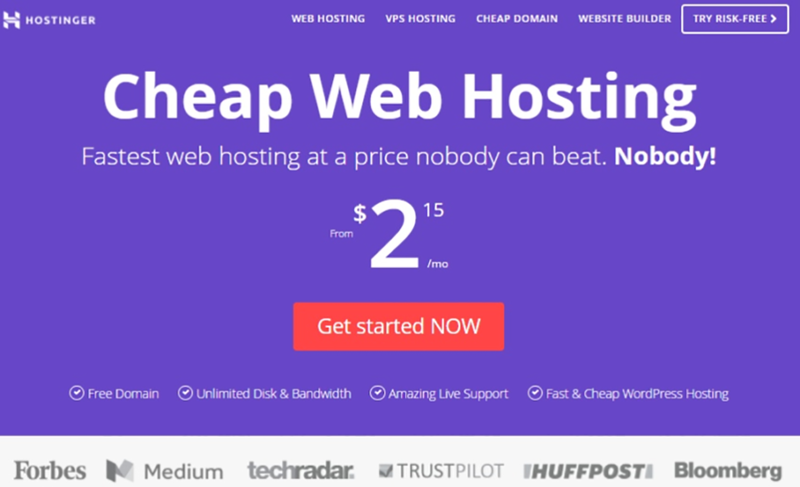 Hostinger Web Hosting Review: Cheapest yet the best web host? ThemeGrill Review on Hostinger! Cheap yet Best? Is it worth the Investment? If you are looking to set up a website of any niche whether it is business based, personal or even portfolio, the one thing that is a necessity is the Hosting. And while we have indulged in the topic of WordPress hostings over and again here on our site, today we will be talking about a specific name that has come across all of us every once in a while. Although there are a lot of options now to get started with your hosting and website, today we wanted to answer the age-old question, Is Hostinger the Cheapest yet the Best Web Hosting out there? Hostinger, a renown WordPress hosting service provider is a name that thousands of users have trusted. Considered one of the cheapest yet the best service providers, we wanted to see if it delivered exactly what everyone thinks about it. So we took it for a spin ourselves, digging deeper and experimented for ourselves! Scroll down further to see what exactly are our thoughts on, Hostinger: Cheap Web Hosting Service! How effective is Hostinger’s Infrastructure? Hostinger is a cheap web host service provider that has been able to provide it’s user with a quality hosting since it’s establishment. Unlike most hostings, Hostinger has managed to survive the test of time and now is a renown name that millions of people trust. It was established in 2004 and with over a decade of experience and good service, the company now hosts over 29 million users all over the world. That is quite an achievement and growth considering there are now tons of premium options to look out for. In 2007, they also launched 0000webhost.com, a free web hosting with no advertisement at all. If you want to know more about this, click on the link below to know all the details. 000Webhost Review- Free Web Hosting Made Easier! With an aim to provide quality service to run a website at a low cost, Hostinger offers high access to advanced users to run a website with ease. Located in USA, Asia as well as Europe, the servers they use illustrate their worldwide reach. So today we wanted to try it for ourselves and answer the age-old question. Is cheap and good possible? To answer the question, let’s take a further look at what Hostinger has in store for us. How Effective is Hostinger Infrastructure? Let’s start off by talking about the cheap web hosting Infrastructure with ultimate quality and premium web hosting features. Because this Hosting relies on their powerful cloud hosting technology, anything that you may need access to will be available for you whenever you need them. Which means that you no longer need to break your bank account just to be able to host a fully functional and feature-rich website. With unmetered and unlimited web hosting of high quality, get top-of-the-notch cloud features and space. All the Hostinger & Business plans are packed with unmetered SSD disk space and bandwidth as to match all your needs individually! It features its own Control Panel with a user-friendly interface fro which you can easily manage all the elements of your domain subscriptions! Using the powerful MySQL databases and Email account, set up any kind of website with ease. Focused on shared hosting as well as scalable VPS (Virtual Private Servers), this hosting provides daily and weekly backups and a free domain name for the yearly plans. In addition to this, there are other advanced features that we will be discussing below. Key Features of Hostinger Web Host! Now that you have the basics of the infrastructure of Hostinger, let’s get a deeper and more thorough look at what Hostinger has in store for us. And why had millions of people all over the world have trusted this cheap web host service over other renown names? When we are looking for a web host the first thing to consider is the Uptime it provides. It simply means the total time when your website is up and running. And with Hostinger, they guarantee a 99.9% Uptime guarantee! The servers that they use are built on a cloud-network which makes sure that you are assured of top availability and always-on websites. And if they do not meet the requirement, you can ask for a 5% credit of your monthly hosting fee! But in our own experience, we never had the chance to do so! Our website run by Hostinger was always accessible and functioning with no problems at all. With smooth running as well as blazing fast loading time, Hostinger is a reliable web-host service that delivers what they claim. Hostinger Website builder is available for everyone who chooses them to host their websites. This powerful tool helps you add elements to your website in a matter of minutes. Although not as effective as other premium or paid Website Builders, it does help you get the job done. You also get to choose from various website templates that are free to get your site started. And the best part about this is, you do not need any coding or technical knowledge to get started with the Website Builder. Use the easy Drag & Drop interface that is user-friendly and customize the site to your preference. Free Domain Name & SSL Security! Unlike most hosting web hosts, Hostinger provides it’s Premium and Business users with a Free Domain Name. Hostinger is a certified ICANN member and is able to provide its users with free domain hosting as well as various other deals. Although this might not sound huge to you, but this does help you save your money in the long run. With the Business plan, you also get access to a free SSL security certificate. This allows you to operate your user’s data or run an eCommerce website with absolutely no security breach. This web hosting is also SEO optimized for an awesome experience online and high ranks on search engines. Once you upgrade to the Premium or Business plans they offer, you get access to a lot of advanced options. This includes unlimited SSD disk space and unlimited bandwidth. As you grow your business and your audiences, Hostinger provides you with unlimited disk space you can use to save the database. You can also transmit an unlimited amount of data with the huge bandwidth that they provide. Host your website with no worries at all as Hostinger has no limits when it comes to providing the necessities of your growing website! Tutorials and Guides available to help! Now that we have talked about the key features included with Hostinger, let’s talk about the pricing and plans they provide for users to choose from. It ranges from zero cost to $1.44/ month. To know more about what features are available on each one, take a look at the table down below. Talking about the support that Hostinger provides, they provide 24-7 all-round-the-clock support. You can contact them with your query through the Live Chat, Email or even Online Ticketing system. In addition to this, you also get access to their knowledge base articles and tutorials that deal with each of the aspects of their web host service. Whenever we encountered a problem, the helpful support team has done their level-best to help us out. So based on our experience, we can say that their excellent customer support is readily available and reliable whenever we need them. With the successful business for over a decade now, there are obviously happy customers who have stayed loyal throughout the years. And while we love Hostinger, a cheap web host service provider to set up our website, let’s take a look at what their customer has to say about them. While using Hostinger to host our websites, we have loved the overall experience online. The user-friendly interface and the easy website builder adds to the appeal of the web host. And with excellent customer support and top-notch features, we highly recommend Hostinger for start-up sites or the ones looking to start their online journey. Even in the long-run Hostinger has survived the test of time and managed to compete with other Premium Web Host service providers. This is enough to prove that Hostinger is definitely worth the investment. And for us, it was enough to say that Hostinger is a cheap yet feature-rich web-hosting that is worth the time and money! But don’t just go with our say and research it for yourself. Test out the trial version and see for yourself! Easy-to-use and with 99.9% Uptime guarantee, we are sure you will love it too and join the 29 million happy users worldwide! ← WordPress CDN: How to Boost WP Speed by Integrating a CDN? 100% agree with you Sam, I could not believe that it is possible to have a cheap and at the same time feature-rich web-hosting 🙂 Great live support, fast service, and easy to use, I hope they will carry on the good work!